Imperial hosted the official UK celebrations for Singapore National Day, as the two nations’ scientific ties grow. 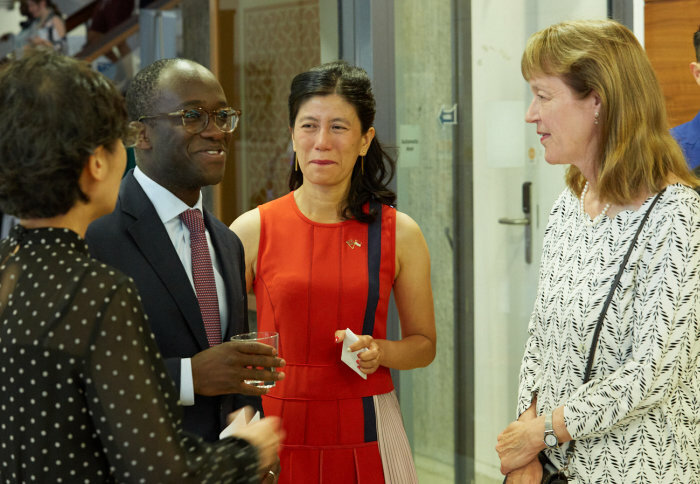 Government ministers, academic, cultural and business leaders from the UK and Singapore came to Imperial for the special event, organised by Singapore’s High Commission. Singapore’s High Commissioner Foo Chi Hsia was delighted that the celebrations coincided with the RAF’s centenary, including a spectacular flypast earlier in the day – mirroring a feature of the National Day within Singapore. 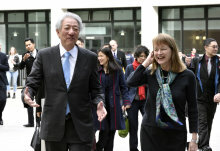 Ms Foo said: “I could not be more glad with the length and breadth of connections between Singapore and the UK… Singapore has generations of undergraduates and postgraduates from Imperial College London,” including Deputy Prime Minister Teo Chee Hean (MSc Computing 1977) who recently revisited Imperial with the High Commissioner. “Our innovation and research collaborations with Imperial College are extensive,” she added. The event’s theme of ‘Smart Nation’ intersected with Imperial’s connections with Singapore, and is set to benefit “not just Singapore, but half of the world’s population who live in cities”. Imperial academics have collaborated on 670 research papers with their Singaporean peers within the last five years. Current work includes a collaboration led by Professor John Polak with A*STAR’s Institute for Infocomm Research and the Singapore Housing & Development Board on how smart sensing and analytics can enhance services in housing estates. 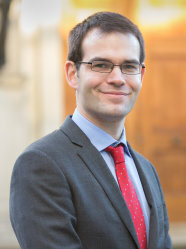 Singapore’s “association with Imperial College is an excellent one,” he added. Guests enjoyed a performance of both national anthems by the British-born Singaporean soprano singer Lehlin Thai as well as Singapore-influenced cuisine and Singapore Slings. Singapore has the highest proportion of Imperial alumni per capita of any city in the world, apart from London, with 2,700 Imperial graduates in the Lion City. Later this month, Imperial’s joint medical school with Nanyang Technological University, LKCMedicine, will hold its first convocation as the pioneering cohort of 52 medics graduate.